Nuance’s NaturallySpeaking mobile apps for the Apple devices, including the iPhone, iPad, and iPod touch, are incredibly easy. Mostly, you tap, speak, and send your messages to Facebook and Twitter. If you like having to figure out how complex applications work, you’re out of luck. The integration with Apple products is nothing short of dead simple. You’ll be up and running as fast as you can download them. 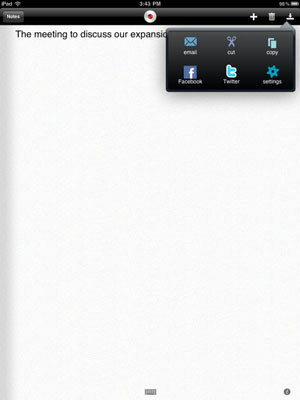 1Launch your Dragon Dictation icon from your iPad home screen by tapping it. You will see the recording screen. 2Dictate the message that you want to post to Facebook or Twitter. 3Tap the down-facing arrow icon on the upper-right side of the screen. A window opens, showing you several choices. 4Choose either the Facebook or Twitter icon. A sign-in screen pops up, asking you to input your screen name and password. You will be asked if you want to send your message. After you set up your log-ins, you’ll be able to seamlessly post your message.